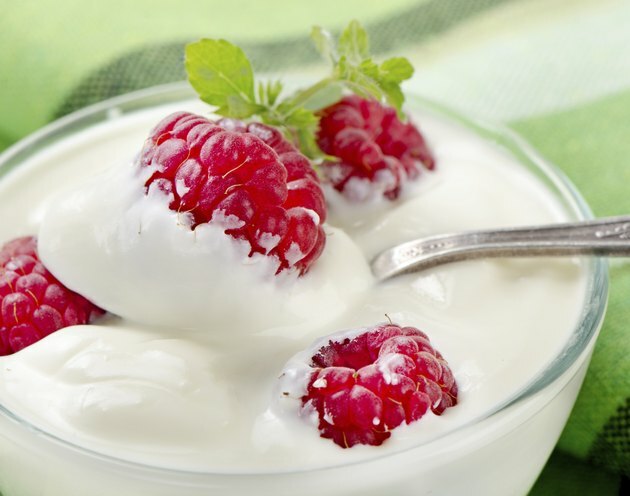 All types of yogurt with live and active cultures offer health benefits, and Yoplait varieties are no exception. The Yoplait brand, however, has some products that are healthier than others. When choosing which yogurt to buy, always check the container's nutrition label to learn more about what you're really eating. Yoplait doesn't heavily advertise its plain varieties, and as of January 2014, they're not even listed on the company's website. But many stores do stock them, and they're typically healthier options than the flavored types. One 8-ounce container of nonfat plain Yoplait yogurt has 130 calories, no fat, 19 grams of carbohydrates and 15 grams of protein. Yoplait also sells a thicker, plain Greek yogurt that has comparable nutrition facts to its plain, nonfat variety. The primary ingredient in Yoplait's plain yogurt is milk, but each container also contains small amounts of cornstarch, kosher gelatin and pectin. Although kosher gelatin isn't known to be harmful, vegetarians and vegans should be aware that many kosher gelatins are sourced from animals or fish. Yoplait's website reports that its original, 6-ounce strawberry banana yogurt has 170 calories, 1.5 grams of fat, 33 grams of carbs and 5 grams of protein. In addition to low-fat milk, its primary ingredients are sugar, strawberries, cornstarch and banana puree. Yoplait's thick and creamy strawberry banana yogurt, also in a 6-ounce container, has 180 calories, 2.5 grams of fat, 31 grams of carbs and 7 grams of protein. Its main ingredients are reduced-fat milk, sugar and nonfat milk, but it contains no real fruit; instead, it's fruitlike color comes from carmine - a red pigment derived from insects. The live and active cultures in all types of Yoplait yogurt are probiotic bacteria, which have a number of health benefits. Most commonly, probiotics reduce or relieve symptoms of gastrointestinal conditions such as constipation, diarrhea and inflammatory bowel disease. Probiotics may also boost immune system function. Yogurt may also have benefits for weight loss. In a study published in 2005 in the "International Journal of Obesity," subjects who reduced calories and ate three 6-ounce containers of nonfat Yoplait yogurt every day for 12 weeks lost more body fat and more weight around the trunk and waist area than subjects who reduced calories and ate a gelatin-based placebo. The higher counts of carbohydrates in flavored Yoplait yogurts come from added sugar as well as added fruits or fruit flavors. Although eating a modest amount of added sugar isn't likely to severely affect your health, the American Heart Association notes that added sugar can raise your risk of obesity and cardiovascular problems. Yoplait's yogurts are also thickened with cornstarch and other additives. You'll get the most nutrition from yogurts that are less processed and list milk and live, active cultures as their only two ingredients. Vegetarian Resource Group: Is Kosher Gelatin Vegan?